It began with a dislocation. A couple of weeks’ residence north of the border in the house of friends who had chosen to trade the Scottish late winter for the Antipodean summer. It was an opportunity for some writing time away from the usual distractions, with the bonus of optional walks along the Firth of Forth to stretch legs and imagination. The house, in a village a dozen miles east of Edinburgh, was situated midway between the railway station and the Forth shore – a ten minute walk to either. And if I needed a dose of cultural inspiration then I could easily catch the train into Auld Reekie and stay for as long as was necessary. Travelling north by train, I don’t think I was even aware that the ‘Beast from the East’ was brewing trouble far away in continental Russia, and I had been installed in the house for a few days before the repeated warnings started to slowly filter into my consciousness. In those first few days of settling in, I usually worked until early afternoon before going out for a walk along the shore before it got dark. The first of these outings was at low tide. I walked westwards along the tide-ribbed sand, picking my way across shallow channels of water to head in the direction of Edinburgh, the city clearly visible ahead around the curve of the estuary. The twin-peaked bulge of Arthur’s Seat nudged the skyline in the distance, looking every bit the extinct volcano it was. Beyond it, the outline of Edinburgh Castle stood out amidst a hazy tangle of high-rise blocks and the spidery cranes of the docks at Leith. Across the calm, dark water of the Forth were the low hills of Fife. Beyond these, beyond the horizon, the jagged peaks of the Scottish Highlands rose stealthily in the imagined yonder of my mind, unseen yet a presence nevertheless. The foreshore, glimmering in the low-slung sunshine of late afternoon, was dotted with waders preoccupied with probing the estuary mud. Periodically some perceived threat would alarm them sufficiently for them to fly off in groups before they settled somewhere else to resume feeding. A mixture of redshanks, oyster catchers and curlews, each bird provided their own distinctive piping call to create a wistful shoreline soundscape. In the shallow water close to shore, groups of wigeon huddled together companionably, elegant feathers rustling in the breeze. Out to sea, just about identifiable at this range, small rafts of goldeneye and eider bobbed dozily in the waves lost in sea duck dreams. Approaching Port Seton I came upon the wreck of a boat sticking out of the sand, its remnant ribs blackened by salt and age. I wondered about the boat’s history; how long it had been wrecked and abandoned here; what of the lives of the men that had once made up its crew? Time and tide had reduced it to a stark sculpture of salt-soaked wood, a skeletal marker for a vessel that had once sailed the Forth and provided a livelihood: a monument to past lives, or perhaps a warning, a cautionary memento that spoke of the power of the sea. On the day before the storm arrived I headed in the opposite direction for my afternoon walk, across the headland of Ferney Ness in the direction of Aberlady Bay through the curious woodland of the Gosford estate. The sky was greyer today; the Fife shore across the water less well-defined, the ships out in the Forth no longer highlighted by sunshine but hunkered down in the water. The signs were there: a change was coming. Large concrete cube blocks lined the shoreline – tank trap defences dating from the last war; an incomplete wall to chaperone the meeting of land and sea. The blocks continued even through the woodland, weaving through the trees like a broken causeway, an accidental land art installation that marched like a concrete-laying behemoth ever eastwards. The ‘beast’ made landfall on Tuesday but the full extent of its might was not fully apparent until the following day. On Wednesday and Thursday it snowed all day without stopping… and then some more – Snow had fallen, snow on snow, as the famous carol goes. The world outside quickly started to lose its familiar topography – the edges of roads blurred then disappeared, footpaths and gardens lost their definition as they submitted to an ever-thickening cover of white. The world had been transformed; made pure, made ice, filtered of colour and tone to leave it monochromatic, but mostly white. The whole notion of travelling far became laughable – in a world without edges there is nowhere else to go. By Friday it seemed almost as if the world had always been like this… and always would be. Frozen in space, frozen in time, this was a world where eternity was cold and white. During a break in the snow showers I ventured down to the Forth shore and found the same transformed world. Stems of straw-coloured grass poked thinly through the snow on the dunes as if grasping for air. Another landfall other than that of the storm had taken place – the fresh arrival of wind-blown thrushes from Scandinavia. The sea buckthorn bushes behind the dunes were flurried with activity, noisy with bird chatter, their branches weighed down with feeding fieldfares that threw themselves up into the air at regular intervals to make a quick fly-over of the beach before returning to the shelter of the bushes and the winter-bleached berries that sustained them. In the trees of the golf links behind, there were hundreds – perhaps even thousands – more of the thrushes perched in the higher branches, occasionally flying up en masse into the air on a whim before returning to the tree. The tide was on the turn and the narrow ribbon of sand and seaweed between the water and dunes held an improbable number of birds frantically sifting through the tide line detritus for something to eat: an odd mixture of redwings and golden plover along with a few lapwings and turnstones. This unusual parliament of birds appeared to coexist peacefully enough, out of the necessity of hunger if nothing else, but it all seemed strange and topsy-turvy: the harsh weather had brought about a dislocation, a disavowal of familiar habitat to leave an absence somewhere else. As if experiencing the aftermath of an apocalyptic event, I felt a parallel sense of dislodgement from the world. Telephone calls to my wife and emails to the house’s owners heightened the sense of dislocation as our communications triangulated between Scotland, Norfolk and Australia. There were absences too – of me at home in Norfolk, of my friends in the house in Scotland. The snow globes of our everyday lives had been given a severe shake up and we were all dislocated, unwittingly or otherwise, from our habitual places in the world. Digital technology has resulted in the world we live in becoming a shrunken globe of instant communication, yet the heavy snow and the enforced lack of mobility that the storm wrought resulted in a sudden reduction of the possibilities the world had to offer. In an instance, while horizons had drawn closer, the world beyond had become vast once more. Life went on as normally as possible. I spent the days indoors writing and editing work, glancing occasionally out of the window to see if it was still snowing. I occasionally ventured out to trace a route to the village shop to buy food basics from its panic-shopped shelves. I followed my own boot prints back on the return journey – Crusoe and Man Friday on a snow-desert island. In the evenings, I cooked a meal and drank a glass or two of rationed wine. I watched the TV weather forecasts and listened to Landfall by Laurie Anderson and the Kronos Quartet, a newly purchased CD that turned out to be uncannily apposite. The music helped to extricate an ear worm: Harry Lauder’s Keep Right On To The End Of The Road, which had been put there by way of googling for something I was writing (don’t ask… not yet anyway). There again, the Lauder song was appropriate too. After five days of snow, wind and reduced horizons, the thaw began. Local trains started to run once more and I was able to get into Edinburgh, where I had the pleasure of meeting up with fellow bloggers Murdo Eason and Brian Lavelle. Meeting with folk whose interests overlapped with my own, my sense of dislocation eased – I was back in the world, the familiar world of brick and stone and street signage, once more. Before I returned home I went back for a final look at the shore. The snow had largely melted by now, although there were still frozen pockets of it on the dunes. The beach birdlife was much depleted: the usual redshanks and curlews were there but only a handful of redwings remained. The sea buckthorn bushes had also fallen silent now, although I could make the silhouettes of a small number of fieldfares that remained in the trees on the golf course. Thousands of birds had vanished overnight from this same locality in the brief transition from freeze to thaw. Their abrupt departure had left a void; an emptiness in the soul of this place, a sudden absence that was almost heartrending. Thanks to Murdon Eason and Brian Lavelle for taking the trouble to slog through the Edinburgh slush to meet up with me. Both have excellent blogs that are well worth investigating, From Hill to Sea and Edinburgh Drift. They have collaborated together to produce the highly recommended book + CD Language of Objects. Kyrgyzstan does not have much of a railway system. A branch line from Moscow extends down from Kazakhstan to Bishkek, the Kyrgyzstan capital; another offers an excruciatingly slow service to Balykchy on Lake Issyk-Kul. Another line extends from Jalal-Abad in the south into Uzbekistan, although trains no longer run on this one. All of these routes date back to Soviet times but even then, Kyrgyzstan, or the the Kyrgyz Soviet Socialist Republic as it was in those days, sat on the outer fringes of the USSR, closer to China than to Moscow. All the more surprising then that, wherever you go in post-independence Kyrgyzstan, you tend to see Soviet-era railway carriages re-located and re-purposed as dwellings, shops, storerooms and even roadside tea-houses. What is most striking is how these are often located far away from a railway line or anything that even resembles a serviceable road. Bump along a rough stony track up to an isolated jailoo (alpine meadow with summer grazing) and the chances are that the nomadic family you meet there will have use of a rusting railway wagon parked somewhere near their yurt. Yurts are ubiquitous in the mountains in summer, and so central to the Kyrgyz way of life that the tunduk, the circular wooden centrepiece of the roof, appears on the national flag. But recycled decommissioned railway wagons have their part to play too, even if rusted metal is less aesthetically pleasing than white felt. In poor countries undergoing rapid transition like Kyrgyzstan, such a resource is too useful to be wasted. All the above images ©Laurence Mitchell. In 1969 an album was released entitled Anthems in Eden. Its creators were sisters Shirley and Dolly Collins, folk musicians who hailed from Sussex in southern England. Released on the newly created Harvest label, and much lauded by the likes of John Peel and other progressive music luminaries, Anthems in Eden was a world away from what normally passed for underground music in those days. I most probably first became aware of Shirley and Dolly Collins through John Peel. Most likely I was listening to my transistor radio beneath the sheets to Peel’s late night BBC programme Night Ride, where all manner of quirky underground music got an airing – folk, classical, film soundtracks, as well as poetry and world music before it was ever even called that. I should have been asleep, of course, so as to be sharp and bright for school the next day but even then I was captivated by strange and beautiful music whatever genre it might belong to. I was never what might be called a folkie but there was something about Collins’ voice, along with the gorgeous melodies and sometimes dark narrative of the songs, that awakened something deep within me. Somehow it aroused an atavistic connection with a long-vanished England of the past. It seemed to connect with the very folds of the landscape itself, with distant land-tilling ancestors who had preceded those forefathers who had uprooted themselves from the countryside to work in the soot-stained industry of the West Midlands. The music of my ancestors – that seemed about right. The record’s first side was a 28-minute song-story that incorporated songs often heard at singarounds at folk clubs, which having enjoyed a boom in the 50s and early 60s were experiencing a slump in fortune by the time the record was released. Instead of the usual finger-picking and finger-in-the-ear approach, the songs, centred upon Shirley’s pure, undemonstrative voice and the plaintive piping of Dolly’s portative organ, were set in a soundscape of medieval instruments – rasping crumhorn, sawing bass viol, scale-sliding sackbut – played by the Early Music Consortium of London. The eccentric, slightly out-of-tune musical setting provided a surprisingly sympathetic backdrop for the traditional songs that were featured, which included Searching for Lambs, The Blacksmith and Pleasant and Delightful among others. The intent of the song-story was to evoke an England that had vanished since the outbreak of the First World War when rural life was torn apart by the savagery and deprivations that ensued. The Great War brought about change as catastrophic as an epoch-ending meteorite strike, brutally fracturing cultural stability like sudden tectonic slippage. Vast numbers of agricultural workers were lost to the Flanders mud; country estates floundered through lack of a workforce; folk traditions that hitherto had been second nature were lost or only dimly remembered. A great disconnection took place. Naturally, there were some benefits to emerge eventually from the debris of war – women’s suffrage, the seeds sown of social change to improve the lot of a downtrodden working class — but the old songs were largely forgotten and England’s utopian Eden, if ever it existed, was lost forever. In the villages of broken post-war England war memorials replaced maypoles. The notion of Eden draws on a long tradition of locus amoenus – an idealised ‘pleasant place’. Such idylls of place, time and circumstance were frequently employed as the backdrop for traditional English song, although the same places might also serve as the realm of dark deed-doing. Traditional English murder ballads tend to inhabit an English pastoral setting as much as Midsomer Murders favours a fictitious village idyll complete with cricket green, parish church and George Orwell’s ‘old maids bicycling to holy communion through the morning mist’. Such a dreamlike ‘pleasant place’ was seen as the apogee of rural life. The narrative action habitually took place on labour-free Sundays and holidays. The weather was always good, the birds always singing. The season was invariably summer. All this, of course, is a literary trope, a celebration of how things might be, or might once have been, had the world been a kinder place. The uplifting sing-along of Pleasant and Delightful, a fragment of the Anthems in Eden song-story, is a case in point. It begins by setting the scene of a pastoral locus amoenus before introducing an element of uncertainty – a love-struck sailor who is due to travel overseas. It concludes with the sailor-narrator taking leave of his true love Nancy to go off on the next tide, promising that ‘if I ever return again’ they would marry. And the larks they sang melodious at the dawning of the day. The suite of songs that make up Anthems in Eden is presented as a vignette of a rural romance before the First World War, before the fall. Its component songs flowing one into the next to describe a meeting, courtship, leave-taking and subsequent forsaking that leads the way to a new beginning. The effect is both a celebration and an elegy to that which had vanished and was now lost. The voice behind the project, Shirley Collins, would go on to experience many losses in her own life: a father who walked out on the young family, two broken marriages, the death of her dear sister Dolly and, most cruelly, the loss of her remarkable singing voice in 1978. The recently released film Ballad of Shirley Collins directed by Tim Plester and Rob Curry documents Shirley’s past life as the ‘High Queene of English Song’. Interspersed with scenes of cosy domesticity at home in Lewes, Sussex is shaky faux-retro 16mm footage of her song-collecting road trip with then-lover Alan Lomax to the United States in 1959, with lookalike actors playing the young Shirley and her much older American beau. The soundtrack features archive recordings of Collins performing, fragments of the material she and Lomax collected in the rural Deep South and original music by Ossian Brown and Michael J. York. The American field recordings are remarkable in their own right. Cleaned-up sonically, yet retaining all their untutored rawness, they include English murder ballads sung by nasal Appalachians, cotton picking blues shouters, maniacal banjoists and, most extraordinary, a hollering polyphonic choir of such unrefined intensity that it sounds capable of raising the dead. The rawness of the collected American material reflects the state of the nation at that time. In interview Collins speaks matter-of-factly about the commonplace violence – domestic, racial and otherwise – she encountered, the shameful segregationism, the unabashed racism that tainted the American South in the 50s. Plus ça change some might say. The crux of the film hinges on the singer’s return to recording after a 38-year absence — the tentative home sessions that will eventually produce her acclaimed 2016 return album Lodestar. Intercut with this are finely observed details of the world that Collins’ and her ageless songs inhabit. The camera flits around, gleaning detail from Collins’ home, the local haunts she visits, the Sussex countryside. It alights on green man masks, on sheep’s heads, on tea mugs and curious pottery figurines; on the Garden of Eden ceramic that was featured on the cover of Anthems in Eden and which hangs on the wall of her musician friend David Tibet’s house. The Sussex landscape looks ravishing throughout, all sloping hills and golden fields of grain that swoop down to white cliffs and the English Channel. A gentle warm breeze seems to be ever-present, rippling the grass and wild flowers in the foreground of the screen. A particularly effecting moment is a lingering long-focus shot of sheep contentedly grazing their way across the hillside chalk feature of the Long Man of Wilmington, the giant’s arms raised to support what look like Norwegian walking poles in each hand. This is Sussex seen as an English Garden of Eden, folk tradition seeped into the ancient chalk of its rolling downs. A landscape gifted as a living repository of the old songs and stories that holds Shirley Collins, lover of tradition yet challenger of what she calls ‘the toxic side of Englishness’, rightfully in place as keeper of the keys. Just three main roads radiate out of Stornoway, the capital of the Isle of Lewis. One heads across mountains towards Tarbet and Harris to the south; another goes east past the island’s airport and along the Eye Peninsula to come to halt at the lighthouse at Tiumpan Head, while a third leads across the island’s moorland interior to reach its west coast. A little way along this last road is the turn-off to Tolsta, a minor road with the most unexpected of endings. The road passes bungalow settlements and sea-facing graveyards as it leads north. In Hebridean terms, this is relatively densely populated terrain — one settlement merging into the next in a loose sprawl known collectively as Back. This stretch of Stornoway’s hinterland might elsewhere be termed green belt were it not a fact that pretty well anywhere on Lewis and Harris could be described as ‘green’. Some fifteen miles from Stornoway, a little way beyond the small coastal village of Tolsta, is Garry Beach, a quiet sandy beach with its own car park. A few campervans are parked up here and a rusty caravan is tethered in a boggy field alongside, more likely a base for itinerant workers than a low-rent holiday home. A couple, well wrapped-up against the cool on-shore breeze, are exercising their dog on the beach. A couple of jagged sea stacks rise vertiginously just offshore; half a dozen oystercatchers methodically work the tideline, red beaks wrestling with molluscs. The asphalt road, single track since Tolsta, ends abruptly at the car park and continues only as a rough peat-digging track that winds up the hillside towards a concrete structure. Walk up here and you soon come to it — a bridge over a narrow gorge that, counter-intuitively, appears to be the very end of the road. The Bridge to Nowhere, as it is generally known, was constructed by Lord Leverhulme, one-time owner of the island, as part of a project to build a road that connected Stornaway with Ness, a fishing village at the northern tip of the island. Like many of Leverhume’s ambitious schemes, good intentions went awry and for a number of reasons the road was never completed. Even today, the only direct way between Tolsta and Ness is on foot, a weary ten-mile slog through soggy moorland that for most people makes the longer, circuitous trip by road via Stornaway and Barvas a more attractive option. The original vision was to build three large farms that would provide dairy produce for fish cannery workers. Alas, the fish canning empire never came to fruition and a lack of both funds and enthusiasm resulted in the road never extended beyond the bridge at Garry Beach. Head south of Stornoway, over the North Harris Hills to Tarbet and then across the isthmus into South Harris, and you have two options to reach to the ferry port of Leverburgh at the southern tip of this, the largest of the Hebridean islands. The road that skirts the west coast is relatively wide and easy to navigate but the road that runs parallel to the east coast, circumscribing many rocky inlets along the way, is of a very different character. The two coasts of South Harris have strikingly contrasting landscapes. While the west road swoops smoothly past enormous tidal sandy beaches like that at Luskentyre, the narrow east road weaves erratically around rugged inlets and rocky outcrops. Rough country, largely soil-less, infertile, with very little land suitable for grazing or farming — you might wonder why people might live here in the first case. The reason, of course, as in so many places in the Scottish highland and islands, is because of widespread clearance in the late 18th and early 19th centuries. The extensive land clearances of Harris were enforced by the Macleod family who once owned the island and who, to make way for their profitable sheep enterprises, forcibly moved many crofters off the relatively fertile land of the west coast to the far poorer, rocky terrain of the east. As a result, many families migrated to Canada to seek a better, more secure life, while those who remained struggled to survive by digging ‘lazy beds’ for potato-growing — labour-intensive raised beds in which the thin poor soil was bulked out and enriched with seaweed and straw. Never was the word ‘lazy’ so misappropriated. To travel the Bays Road, as the C79 east coast road is better known, is to witness a dramatic sweep of exposed gneiss, sky and water, with ever-changing glimpses of narrow rocky inlets, dark reed-filled pools and peat-stained streams the colour of strong-brewed tea. The road is not for drivers of a nervous disposition – narrow even for a single lane, with a general allocation of passing spaces, it is a constantly winding tour-de-force where each mile covered seems more like five. Stark, barren, primeval: the landscape is far from bucolic but it is undeniably beautiful. Sheep wander across the road with impunity; white-tailed eagles and buzzards spiral slowly overhead; curious ravens perch on rocks eyeing the sporadic passing traffic like pensioners on a park bench. For the briefest of moments, a pair of golden eagles make an appearance silhouetted high above a ridge. At the road’s highest point, the peaks and headlands of the Isle of Skye show themselves to the east across the wave-flecked Little Minch. The sea is translucent, deepest blue; a CalMac ferry is halfway across the channel steadfastly plying its twice-daily journey to Uig on Skye. In the diamond-clear light, the far-distant Cuillin Hills can be seen glinting crystalline in the sun. Deprived of a decent livelihood by uncaring landlords, you can only reflect that the crofters who were banished to this unwelcoming, unworkable terrain were at least given possession of some of the finest viewpoints in the kingdom. Someone once said that the wonder evoked by historical sites is inversely proportional to the number of eyes that have already gazed upon them. ‘Must-see’ tourism and mystery tend to stand in direct opposition. This is partly connected with the familiarity of the site itself — how well we think we already know somewhere from postcards, tourist board propaganda, travel features and social media. The Pyramids at Giza, probably the oldest tourist destination in the world, are a prime example. Magnificent though they may be, there is much at the site to detract from unbiased appreciation: crowds, trinket hawkers, faux guides, camel-hire men, and the very fact that an image of them has been burned into the retina since childhood even if we have never even stepped from these shores. Similarly Stonehenge, England’s prime sacred site, which is of even greater antiquity and in many ways even more mysterious than the Egyptian pyramids in terms of function. In recent years, for perfectly understandable reasons, the monument has been sanitised and practically cling-film-wrapped by its guardians at English Heritage. New Age travellers, modern-day druids and miscellaneous stone-huggers are kept well away if at all possible, while the sightseeing general public is discouraged by means of fences, timed tickets, high entrance fees and the benign tear gas of lavender-wafted gift shops. The presence of large coach parties and the constantly rumbling A303 does little to engender a mystical atmosphere either. This may seem a little harsh but, personally speaking, I can no longer bring Stonehenge to mind without thinking of the film Spinal Tap and a particularly comical stage set. A place which, for me, has far more resonance is Callanish on the Isle of Lewis in the Outer Hebrides. Not that it is undiscovered, far from it — this 5,000 year-old stone circle has long served as a poster girl for Scottish Highlands and Islands tourism promotions — but Callanish/Calanais is at least suitably remote, close to the western shore of Lewis and the best part of an hour’s drive from Stornoway, the main town on the island. The first thing you notice on arrival — the stones themselves are already half-familiar thanks to photographic reproduction — is the immense beauty of the landscape that surrounds the site. Less raw and perhaps a little softer than some Lewis scenery, the stones stand on a bluff above the small eponymous village that developed in their shadow. The view from the hill is a pleasing vista of lochs and inlets, with the low hills of Great Bernera rising in the distance, the outlying stones of Calanais II and III pinpointed by distant figures on their way to view them. The stones, of course, are not deserted of people — it is a fine late September day when we visit and visitors are making the most of the clement weather. A couple of tour minibuses are parked up outside the visitor centre and the gift shop and café are both enjoying a brisk trade. Walking the short track that leads to the stones we come upon a French tour group who are engaged in photographing each other as they stroll around the monoliths. Most of the women of the group sport black midge masks that droop in front of their faces like saggy proboscises — the fine mesh protecting them from ravaging insects. The donning of masks also appears to be an unconscious act of sympathetic magic as their chosen headgear makes them look uncannily like giant flies — biped flies, that is, garbed in Gore-Tex and Barbour. Truth be told, the midges are really not all that problematic and it seems that the French fly-women are perhaps overreacting to the perceived threat. It seems a little ironic, too, that they hail from a country that banned all-enveloping face coverings like the burqa just a few years ago. The site is relatively busy yet the proverbial camera proves to be an efficient liar. It is approaching lunchtime; the crowd around the stones has already thinned, and it does not take long to snap a number of images in which no human presence is detectable. No doubt, with sufficient Photoshop tweaking, I could possibly also adjust the contrast and saturation to simulate a sunrise rather than late morning scene. But I am happy as things are and reflect that as most of the evidence points towards Callanish being constructed as a temple orientated to moon-rise I really ought to be here at night instead. The Callanish site is well known and rightly cherished but there are other, less-heralded standing stones in the vicinity. The previous day we had come across a small group of monoliths close to the bridge that leads across to Great Bernera. These stones, fewer but similar in size and shape to those at Callanish, were of the same three-billion-year-old Lewisian gneiss, one of the oldest rocks on Earth. Known locally as Tursachan (Gaelic for ‘standing stones’), or more prosaically by archaeologists as Callanish VIII, they stood on the island of Great Bernera overlooking the bridge from the Lewis mainland. Formerly an island off an island (Lewis and Harris), which, in turn, stands off a much larger island (Scotland, England and Wales), Great Bernera has only been connected to Lewis by bridge since 1953. When first erected, the semi-circle of four large stones would have stood sentinel-like overlooking the straight between the island and Lewis; now they overlook the bridge that connects them. 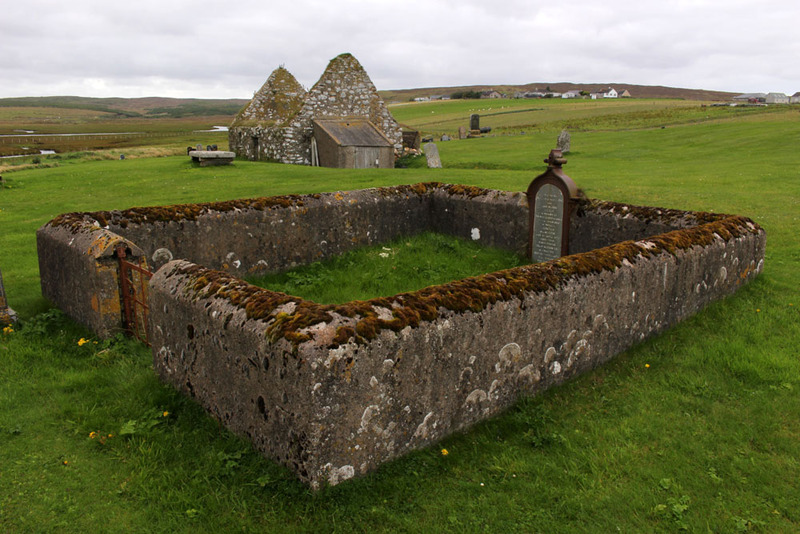 Unlike their better known neighbours to the east these stones are now almost forgotten. With little more than a modest signpost to point them out, they are a sidebar of prehistory, mere cartographic marginalia on the OS Explorer 458 West Lewis map. Eleven miles east of the main road, six from the nearest shop (closed on the Sabbath), two miles from the open sea as the raven flies. 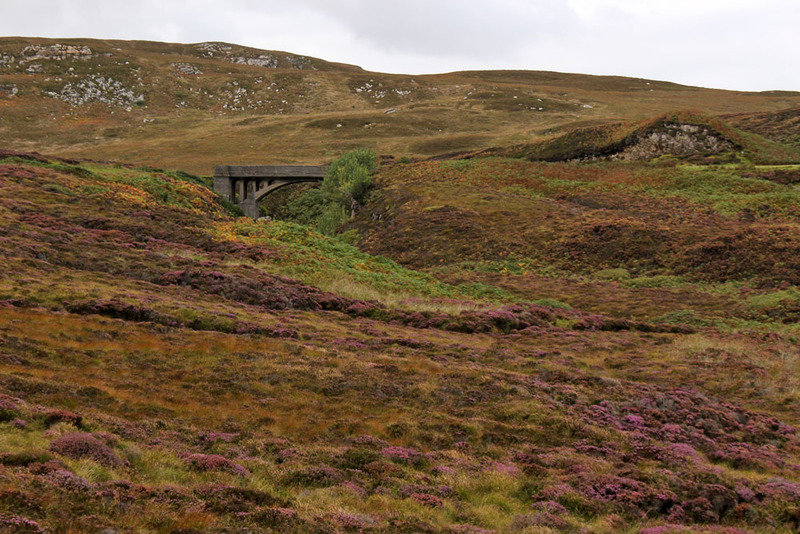 Glen Gravir – a slender thread of houses stretching up a glen, just four more unoccupied dwellings beyond ours before the road abruptly terminates at a fence, nothing but rough wet grazing, soggy peat and unseen lochans beyond. This was our home for the week, a holiday rental in the Park (South Lochs) district of the Isle of Lewis in the Outer Hebrides. Gravir, of which Glen Gravir is but an outpost, is large enough to feature on the map, albeit in its Gaelic form, Grabhair. The village – more a loose straggle of houses and plots – possesses a school, a fire station and a church but no shop. A road from the junction with Glenside next to the church winds its way unhurriedly downhill to the sea inlet of Loch Odhairn where there is a small jetty for boats. Some of the houses are clearly empty; others occupied by crofters and incomers, their occupants largely unseen. Others are long ruined, tenanted only by raven and opportunist rowan trees, with roofs absent and little more than chimney stacks and gable walls surviving. It is only a matter of time before the stones that have been laid to construct the walls will be indistinguishable from the native gneiss that underlies the island, surfacing above the bog here and there in outcrops like human-raised cairns. Lewisian gneiss is the oldest rock in Britain. Three billion years old, two-thirds the age of our planet, it is as hard as…well, gneiss. It is the same tough unyielding rock that five thousand years ago was painstakingly worked and positioned at the Callanish stone circle close to Lewis’s western shore; the same rock used to build the island’s churches, which occupy the same sacred sites, the same fixed points of genii loci that had been identified long before Presbyterianism or any another monotheistic faith arrived in these isolated north-western isles. Ancient hard rock (as in metamorphic) may underlie Lewis, but religion is another bedrock of the island. Despite a respectable number of dwellings the only people we ever really see in the village are those who come in number on Sunday. The Hebridean Wee Free tradition guarantees a full car park on the Sabbath when smartly and soberly dressed folk from the wider locality congregate at Grabhair’s church, which, grave, grey and impressively large, is the only place of worship in this eastern part of the South Lochs district. At the bottom of the lane beneath the hillside graveyard next to the church are a couple of recycling containers for villagers to deposit their empties and waste paper. Larger items of material consumption are left to their own devices. Rain, wind and thin acidic soil are the natural agents of decay here. Beside the roadside further up from our house lie four long-abandoned vehicles in various stages of decomposition. Engines are laid bare; bodywork and chassis, buckled and distressed, rust-coated in mimicry of the colour of lichen and autumn-faded heather. Cushions of moss have colonised the seating fabric. The rubber tyres remain surprisingly intact, the longest survivor of abandonment. Sharp-edged sedges have grown around the rotting car-carcasses as if to hide them from prying eyes, preserving some modicum of dignity as the wrecks decay into the roadside bog, all glamour expunged from a lifetime spent negotiating the island’s narrow single track roads. On Lewis, vehicles die of natural causes, not geriatric intervention. Our cottage was rented as an island base: a place to eat, rest and sleep before setting off each morning on a long drive to visit one of Lewis’s far flung corners. Happily, it feels like a home, albeit a temporary one – a domestic cocoon of cosiness with all the modest comforts we require. Its small garden is a haven. As everywhere on the island, tangerine spikes of montbretia arch like welder’s sparks from the grass. Rabbits scamper about on the lawn, colour-flushed parties of goldfinches feed on the seed heads of knapweed outside the kitchen window. Robins, wrens and blackbirds flit around the trees and shrubs that envelop the cottage – non-native plants that have adapted to the harsh weather conditions of this north-western island, softening an outlook that on a grey, wind-blown day, with a gloomy frame of mind, might be considered bleak. Bleak perhaps, but beautiful: nature simplified to an essential dichotomy of land and sky – the former, solid, dark, numinous, unrelenting; the latter, capricious, changing in minutes from Mediterranean blue to storm-cloud black, with a cloudscape that can quickly morph from a liquid mercury-silver to a rose-pink blush. There seems to be something about the air here that enables a clarity of sight, even when it is overcast or misty – an acuity of vision, a sharper edge to things. The topography is finely delineated, a bold line divides earth and sky like the firm brush stroke of a child’s painting. Most days on our jaunts around the island we would see an eagle or two, golden or white-tailed, sometimes both. The majority of these sighting are in more mountainous Harris, or in that southern part of Lewis that lay close to the North Harris Hills, but on our last day on Lewis we see a white-tailed eagle fly over Orinsay, a village relatively close to where we have been staying. An hour later we spot another bird swoop along the sea loch at Cromore, a coastal village that lies a few miles to the north. It might well be the same bird. White-tailed eagles are very large and hard to miss, and their feeding range is enormous. But that is exactly how Lewis seems – enormous, almost unknowable despite its modest geographical area. A place larger than the shape on the map – a mutable landscape of rock, sky and water that does not easily lend itself to the reductionism of two-dimensional cartography. The Japanese have an expression – shirin-yoku (‘forest bathing’) — which refers to time spent in a wood or forest for purposes of health and relaxation. Scientific field studies have demonstrated that spending even a short time among trees promotes a lower concentration of cortisones, lower pulse, lower blood pressure, decreased levels of stress and improved concentration. In Japan activities such as shirin-yoku are part of the culture and hold an important place in the national psyche. Modern Japanese culture is still rooted in ancient nature-worshipping Shinto beliefs that are expressed in a variety of ways. Perhaps the most striking of these for westerners is the annual celebration of the sakura (cherry blossom) season that seems, almost atavistically, to drive an entire nation into parks clutching picnics, beer coolers and selfie sticks each spring. In the West, things are different, and such worship of nature tends to be more a private practice than a social or cultural one on the whole. Certainly, while most would admit to enjoying an autumnal woodland walk, a family ramble though crackling leaf litter on crisp, white-breath days, for much of the year forests are spurned by most of the population, perhaps even slightly feared by some. The forest, the greenwood, comes with cultural baggage. It is sensed to be a place of ‘the Other’, a place of wild things, of decay, of hidden danger; of runaway fugitives, mythical outlaws — Robin Hood being prime example — deserted children (Babes in the Wood), ghosts and malevolent spirits. There is no denying that some tracts of woodland are downright spooky, places where dark forces can be felt to be at large. Traditional children’s literature does not help much in mitigating this irrational if primal fear. In fact, it nourishes it — one of the very first books I remember reading as a small child was Winkie Lost in the Deep, Deep Woods, the very title of which suggests some sort of unspoken dark menace. As an archetype, a forest is perceived as an eldritch zone where wicked witches live alone in eerie hovels, where red-cloaked little girls are preyed upon by egregious wolves, and large gatherings of ursine cuddly toys attend sinister secret picnics. Go into the woods (today) and you might well be ‘sure of a big surprise’. In adult life the same fear is perpetuated as a trope of the horror genre — the psychological terror of The Blair Witch Project springs to mind. The forest is a place where bad things happen — a place to bury the bodies. Be afraid. Even Japan with its devotion to sakura and forest bathing traditions has its fair share of indigenous forest demons. The country even has its own haunted forest, Aokigahara, at the foot of Mount Fuji, which has the unenviable reputation of beings the world’s second most popular choice as a place for suicide. But let us embrace a positive outlook and view woodland as a place of wonder and nurture rather than fear and loathing, a place to breathe in the beneficial volatile oils emitted by trees and enjoy their beauty. Where better to delve into the greenwood in Britain than a tract of temperate rainforest that has hardly changed since the last glacial period? Coed Felinrhyd in North Wales has stood largely untouched since from this period and, although tracts of this woodland have been partially managed over the centuries, other parts have remained undisturbed for around 10,000 years. Coed Felinrhyd, owned by the Woodland Trust, is just a fraction of the remnant temperate rainforest found in this damp corner of Wales: a 90-hectare tract of woodland on the southern side of the narrow Ceunant Llennyrch gorge through which the mercurial Afon Pryser, a tributary of the Afon Dwyryd, flows. Coed Felinrhyd’s particularities of relief and climate, tucked away in a sheltered, virtually frost-free gorge close to the Welsh coast in a region where it rains on average 200 days a year, ensure that the ecosystem here is in many ways unique. Scarce plants and ferns thrive in the understory, rare lichens and mosses cloak the trees. But this is more than simply remarkable ecosysytem, this is also a place where geography and legend intertwine – the forest receives a mention in the ancient Mabinogion myths written down in the 12th century and is said to be the location where two warriors once fought to the death. The entrance is a little hard to find, hidden away just beyond the entrance to the Maentwrog power station on the Blenau Ffestiniog to Harlech road. A Woodland Trust notice board by the gate gives background information on Coed Felinrhyd and a signpost points out the direction of a well-defined trail that circuits the forest. The trail climbs steeply at first, then more gently before levelling off. The first thing to be noticed, other than the towering oaks that stretch in every direction, is moss. Although ferns are almost as prolific, sprouting like green shuttlecocks wherever they can secure a foothold, it is moss that is everywhere cloaking every surface — on the bark of trees, on the rocks that line the pathway, on the dry stone walls that partition the woodland; on any surface where moisture can collect. Even most of the tree stumps are upholstered with velvety jade cushions of moss, their cut surface having been rapidly colonised by the feathery fronds of bryophytes. Each of these is a pedestal-raised forest in miniature, a Lilliputian lost world — this small tract of woodland contains a million tiny moss forests within it. Some of the tree stumps have been cut mischievously into the shape of a chair or a four-legged stool, the work of a rogue woodsman with a sense of humour and an artistic streak. A few of are fresh enough to not yet sport the forest’s inevitable green uniform, although no doubt soon they will. Having reached a plateau in the woods we come across a ruined slate barn beside the trail, its roof long gone and ferns sprouting like bunting on top of the walls where the eaves should be. Long abandoned, the building is probably at least two hundred years old and a remnant of the old farming practice of ‘hafod a hendre’ in which shepherds would remain on higher pasture with their flocks during summer. The track continues past clumps of trees that seem to emerge directly from the moss-carpeted boulders at their base. The blanket of moss and lichens that covers both gives the impression that both tree and rock are born of the same material, something primal and green that is neither strictly vegetable or mineral but something in between. Descending back down into the valley we arrive at a dry stone wall that has a gate which leads into Llennyrch, a neighbouring tract of forest of similar pedigree to Coed Felinrhyd. We follow the wall to the left and the sound of rushing water becomes gradually louder as the gorge reveals itself. A small viewing platform gives a glimpse of the waterfall of Rhaeadr Ddu that plummets down onto the rocks below although the view is partly obscured by the dense foliage. The river is still some way beneath us but we draw closer to it as the path gradually descends. Finally we come to Ivy Bridge, which, true to name, is enveloped by long trails of ivy that hang over the edge almost touching the water and rocks beneath. Beyond the bridge, on the other side of the river, the unsightly machinery of an electricity substation can be discerned beyond a fence; beyond this, unseen from this position, lies the Maentwrog power station. After two hours of slow walking, looking, taking photographs and what can only be described as mobile ‘forest bathing’ we are back where we started. It suddenly occurs that we have met absolutely no one on our walk even though it is a relatively bright day with little threat of rain. No hikers or dog walkers, no botanists or tree-huggers, no Celtic warrior ghosts. And, to the best of our knowledge, no malevolent woodland sprites either. Back in April I took part in a writing workshop in Suffolk led by Ivor Murrell of Suffolk Poetry Society and Melinda Appleby of Waveney & Blyth Arts. The workshop encouraged the participants to immerse themselves in the sights, sounds and smells of the Blyth estuary and to reflect something of the history and nature of the area. The following is what I came up with on the day. We followed the estuary path beneath spindly oaks in first flush leaf, the reedbeds rippling in a southerly breeze. Across the water, white-faced cattle grazed on the sloping pasture: a pastoral diorama framed by willows with the Southwold skyline beyond – church, lighthouse, a scaffolded water tower. This once was a place more connected to the sea, to fishing and trade; the town’s lighthouse, no mere curiosity but earning its keep as a warning to shipping. This was before the great silting and scouring of the coast, when Dunwich was a name on every seafarer’s lips and Suffolk was still holy – Selig Suffolk; before the great land grabs of enclosure and dust storm robbery of the sheep walks, before hangings and suicides cursed the brackish waters of the Blyth. Now only the names on the map gave the clue: Deadman’s Creek, Bloody Marsh. And Angel Marshes – did this expanse of reed and tidal water take its name from the wooden figures that graced the roof of Holy Trinity Church, angels that you might just imagine taking flight at dusk to quarter the marshes crepuscular as owls? A chance to flex stiff wings and dust themselves of woodworm and Puritan shot; a flight to taste the brine of the incoming tide before following the creek back to settle like beautiful bats in their resting place in the rafters. Did anyone see them, even catch a glimpse? Or did they steal between the cracks of the day, visible only to curlew and estuary ghosts? A recent re-reading of Richard Mabey on the ancient and revered Fortingall Yew in Scotland put me in mind of other trees with a well-documented spiritual connection. Such a tree is the sacred fig (Ficus religiosa) or bodhi tree in whose ample shade Gautama Buddha is said to have attained enlightenment whilst meditating. The site of this sacred tree is in present-day Bodh Gaya in Bihar state in India. The original tree is said to have been destroyed but a branch of it was taken by Emperor Ashoka to Anuradhapura in Sri Lanka in 288BC. A cutting from this descendant tree was later returned to Bodh Gaya thus ensuring that the tree that stands at the Mahabodhi temple complex is, in theory, a clone of the original – a tree historically if not genetically predisposed to spiritual enlightenment. I visited Bodh Gaya in early 2008, breaking my journey from Varanasi to Kolkata by way of a detour via Patna and Gaya to spend a couple of nights in the pilgrimage town. Venerated as the most holy place in Buddhism, Bodh Gaya is less a town, more an extended religious complex with temples and monasteries belonging to all manner of Buddhist traditions. Bodh Gaya lies close to the poor, crowded city of Gaya, a scooter-taxi ride through dusty farmland in one of India’s most poverty stricken and politically corrupt provinces. The weather was dank and drizzly, although this being India it was still unremittingly hot and humid; the sky was grey-white without feature, drained of colour, which is something that can rarely be said about India in general. Spoiled for choice for accommodation, I lodged in a friendly Tibetan establishment where I was served hearty dumplings and beer with the meals – as befits a people living on a high arid plateau, Tibetan Buddhists have a tolerant and pragmatic outlook on life. Buddhists from all over the subcontinent thronged the streets and thoroughfares that linked the town’s numerous temples, and I encountered Burmese, Tibetan and Nepalese pilgrims as well as Ladakhis and mountain folk from all over the Himalayan region. The pervading atmosphere was undoubtedly one of gleeful joy, with excitement and piety shown in equal measure. For many of the visitors, poor farmers from isolated mountain villages, this pilgrimage would probably the only journey in their lives that would take them so far away from home. It must have felt much the same in medieval Europe when adventurous folk made long arduous journeys to Rome, Santiago or Canterbury. I am no Buddhist but nevertheless I paid my respects to a wide variety of the town’s temples, driven more by curiosity and cultural interest than any sort of spiritual craving. I was particularly interested in the ancient sacred fig that grew at the Mahabodhi temple and so joined the cheerful crowd that repeatedly circumambulated the temple. The route followed a walkway that passed beneath the boughs of the sacred sprawling tree on each circuit. The sacred fig tree, many branched and mature, was protected behind a stone wall along which many saffron shawls had been draped to signal the tree’s sanctity. Such physical confinement seems a characteristic of venerated ancient trees – Mabey had complained in his piece of the Fortingall Yew being disappointingly inaccessible, and even at home here in Norfolk the 900-year-old Hethel Old Thorn, the subject of an earlier blog post, is surrounded by a solid wooden fence fence. After a few clockwise revolutions around the temple I noticed a small group of Himachali pilgrims on their hands and knees on the paving beneath the tree. I saw that they were gathering some of the tiny figs that had fallen from the tree. No larger than blackcurrants, I wondered what they would do with the fruits – eat them or make some sort of spiritually charged cordial? – but apparently they would be used to create prayer beads. I gathered a small handful myself and over the next few days dried them out on tissue on the window ledge of wherever I was staying. Back home a couple of months later I tried my hand at germinating the fig seed I had gathered in India. I planted dozens of the miniscule seeds in potting compost and within a few weeks had half a dozen or so plants. Four of these survived the re-potting process and of these I kept three and gave one to my friend Karin who had expressed an interest in what I had done. One of my plants, clearly the runt of the litter, did not last long but the other two have grown slowly over the years to become decent-sized pot plants. Nine years later the figs still grace the windowsill of my kitchen – the diffused light and the humidity seems to suit them reasonably well although scale insect is a perennial problem and I have to swab them with diluted washing-up liquid to keep the sap-sucking insects under control. Karin keeps her plant in her living room and it is now larger than either of mine, with larger, if fewer, leaves. Undaunted, I like to think that my little fig trees still have a touch more wildness about them, a little more ecological integrity. A stone temple in a warm sub-tropical climate is, of course, better suited to their natural requirements – they naturally desire to clamber over stone, to bake in stultifying heat, be seasonally soaked in monsoon rain. But they are, after all, strangler figs by nature – forest dwellers that germinate on the wood of other trees before eventually taking over their host — and even a Buddhist temple in India is not the species’ ideal habitat let alone a windowsill in northwest Europe. Whether either of these direct descendants of Buddha’s sacred tree will ever grow large enough for me to be able to sit and meditate beneath is unlikely but I like to think that their presence adds a little oriental wisdom to whatever I get up to in the kitchen. In the event of my ever moving home – not something that is even vaguely on the horizon right now – I will be looking for a place with some sort of conservatory. It will probably be the plants that dictate such a move, rather than any motive of down-sizing or considerations whether or not I can still negotiate stairs in my dotage. In the meantime I will keep on re-potting and squishing scale insects. Enlightenment is mine for the taking but I must be patient. The Saints is a small, loosely defined area of northeast Suffolk just south of the River Waveney and the Norfolk border. Effectively it is a fairly unremarkable patch of arable countryside that contains within it a baker’s dozen of small villages with names that begin or end with the name of the parish saint: St Peter South Elmham, St Michael South Elmham, St Nicholas South Elmham, St James South Elmham, St Margaret South Elmham, St Mary South Elmham, St Cross South Elmham, All Saints South Elmham, Ilketshall St Andrew, Ilketshall St Lawrence, Ilketshall St Margaret, Ilketshall St John and All Saints Mettingham. The area is bisected in its eastern fringe by the Bungay—Halesworth road that follows the course of Stone Street, a die-straight Roman construction, one of several that can still be traced on any road map of East Anglia. On the whole though the roads around here are anything but Roman in character: narrow, twisting, often bewilderingly changing direction, and marked with confusing signs (too many saints! ), it is a good place to visit should you wish to humiliate your Sat Nav. John Seymour in The Companion Guide to East Anglia (1968) describes The Saints as ‘a hillbilly land into which nobody penetrates unless he has good business,’ which is perhaps hyperbolic but there is undoubtedly a feel of liminality to the area that persists to this day. The village names conjure a medieval world where saint-obsessed religion loomed large. Such a tight cluster of settlements suggests a concentration of population where parishes might eventually combine to form a town or city – with 13 villages and the same number of churches (eleven of which are extant), there were more churches here than in all of Cambridge. But The Saints never coalesced to become a medieval city – none of the villages had a port, defensive structure or even significant market to its credit and consequently the area would slowly slip into obscurity as the medieval era played out and other East Anglia towns and cities – Cambridge, Bury St Edmunds, Ipswich and, of course, Norwich – took the baton of influence and power. It was not always so: one of the villages in particular held great significance in its day. The land covered by the South Elmham parishes was once owned by Almar, Bishop of East Anglia and the late Saxon Bishops of Norwich had a summer palace here at St Cross, now South Elmham Hall. The most intriguing of the churches lies within the same parish. It is not in any way complete but a ruin framed by woodland a good half mile from the nearest road. South Elmham Minster, although probably never a minster proper, is veiled in mystery regarding its origins but its appeal owes as much to its half-hidden location as it does to its obscure history. South Elmham may have once been the seat of the second East Anglian bishopric (the first was in Dunwich, the sea-ravaged village on the Suffolk coast), although North Elmham in Norfolk seems a more likely contender. Whatever the ruin’s original function – a private chapel for Herbert de Losinga, Norwich’s first bishop, is another possibility, or it may even be that a second bishopric was founded here – the church in the wood just south of South Elmham Hall dates back at least to the 11th century. It is probably older in origin – a ninth-century gravestone has been unearthed in its foundations. The site itself is undoubtedly of greater antiquity: a continuation of an earlier Anglo-Saxon presence that occupied the same moated site, which, earlier still, was home to a Roman temple and perhaps, even earlier, a pagan holy place. We leave the car in a muddy parking area alongside another vehicle and a dumped piece of agricultural machinery. Nearby stands a weather-beaten trestle table that suggests that this once might have served as a designated picnic spot. Now half-submerged in grass and thistles, the table did not look as if any sandwich boxes had been opened on it for some time. Things have changed here a little in recent years: the permissive footpaths that once threaded through the South Elmham estate are no longer available for the public, and the hall itself has been re-purposed for use as a wedding and conference venue. At least the minster was still accessible by means of a green lane and a public footpath across fields. The green lane is flanked by mature hedges frothed white with blackthorn blossom. Reaching its bottom end we turn left to follow a footpath alongside a stream, a minor tributary of the River Waveney; strange hollowed-out hornbeams measure out its bank. Soon we come to the copse that contains the ruin, a rusty gate gives admission across a partial moat and raised bank into what can only be described as a woodland glade. The ancient flint walls of the church stand central, striated by the shadow of hornbeams still leafless in late March. There is no sign of a roof but the weathered walls of the nave are clear in outline, as is the single entrance to the west. On the ground, last year’s fallen leaves provide a soft bronze carpet that is mostly devoid of ground plants. Church or not, there is a timelessness to this place in the woods. And a strong sense of genius loci, the sort of thing that put the wind up the Romans with their straight lines and four-square militaristic outlook. I wander off to explore the bank to the west and discover the opening of a badger sett that looks to be newly excavated. Without much expectation, I rummage though the spoil musing that there might just be the remotest of chances that, burrowing deep beneath the mound, the animals have thrown up some treasure long buried in the soil below: an Anglo-Saxon torc, a Roman coin perhaps? I would even settle for a rusty button, but nothing. No matter, the mystery of the place is enough for now. We leave the bosky comfort of the site and retrace our steps along the beck and green lane back to the car. The other car has gone – we never did see its occupants.